The proposed caretaker committee of the All Progressives Congress (APC) which will take over control of the National Working Committee of the party from Chief John Odigie-Oyegun led national exco will be dominated by loyalists of President Muhammadu Buhari and national leader of the party, Asiwaju Bola Tinubu, Nigerian NewsDirect has learnt. The power-sharing arrangement between Buhari and Tinubu is one of several ways the presidency wants to entice the former Lagos governor who felt betrayed by the shabby treatment meted to him by the Presidency after he assisted the President to win the presidential poll at his fourth attempt after failing thrice without the support of Tinubu. Buhari had appointed Tinubu as the head of reconciliation committee of the party so as to bring peace to states where there are squabbles among the Stakeholders but inside sources revealed to Nigerian NewsDirect that the appointment is to bring Tinubu closer to the President as the general election is fast approaching. However, the appointment of Tinubu did not go down well with Oyegun and some members of the NWC. Tinubu reported Oyegun recently in a letter to Buhari accusing the former Edo State governor of frustrating his peace moves, an allegation vehemently denied by Oyegun. 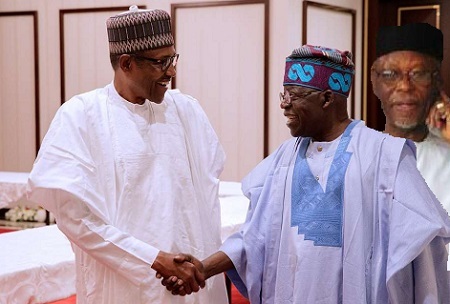 Meanwhile, sources close to the Presidency informed Nigerian NewsDirect that the President knows he needs Tinubu as a rallying point in the Southwest, the geo-political zone that has the second largest number of voters after Northwest. Data from the Independent National Electoral Commission (INEC) shows that total number of voters in Northwest is 18,505,984 followed. closely by Southwest with 14, 626,800 voters while Southsouth is third with total registered voters of 11,101,093. The North Central states have 10,586,965 while the North East has registered voters of 9,929,015. The Southeast has the least number of registered voters as at the end of January 2018 with 8,293,093 voters. In all, there are total of 39,021,964 registered voters in the North while the South has a total of 34,020,986 voters. According to the sources, the records is giving the President and his strategists sleepless nights. “If the results of 2015 general election is anything to go by, then the President should forget winning in the Southeast and Southsouth parts of the country, with the current security situation in some North central states, the President may not have it so easy, if PDP decides to bring their candidate from any of the North Central states, the President won’t have it so easy as he did against former President Goodluck Jonathan, so he must device means of getting bulk votes from the two most populous geo political zones in the country so as to counter any opposition votes from other parts of the country” a former member of House of Representatives close to Tinubu told Nigerian NewsDirect in confidence. “The President has seen that those parading themselves as political gladiators in the Southwest are paperweight politicians who cannot ensure victory for the President in Yorubaland,” he added. In the meantime, plans have been concluded to dissolve the party’s NWC, anytime next week in order to constitute a Caretaker Committee. It was further learnt that the planned dissolution of the Oyegun-led NWC is expected to take place in Abuja. While it was not specifically stated if the decision to dissolve the NWC is as a result of Tinubu’s peace-making efforts, it was gathered that the aim is to position loyalists of President Buhari and Tinubu at the helm. Meanwhile, tension has reached astronomical high level among supporters of the big guns in the party as the party prepares to hold the caucus and National Executive Council meetings this week. The meetings, scheduled to hold on Monday and Tuesday, are expected to find solutions to the internal conflicts rocking the ruling party. However, Nigerian NewsDirect learnt that some powerful forces close to Oyegun are pushing for the postponement of the meetings so as to give soft landing for the embattled national chairman and his team. The NWC is currently working for tenure elongation for the whole committee but many Stakeholders are opposed to the idea. The National Legal Adviser of the party, Dr Muiz Banire was suspended by the Ward ‘C’ Chapter of the party in Mushin Local Government Area of Lagos State; he was suspended for a period of 10 years for allegedly engaging in acts of anti-party activities and misappropriation of campaign materials and logistics. The suspension of Banire was later cancelled by the NWC of the party which ruled that a local chapter does not have the power to suspend national officer of the party. However, political observers in Lagos believe that suspension of Banire was due to the role he played in the local government election in Lagos where he openly criticized imposition of candidates by the leadership of the party in the state. Another member of Oyegun-led NWC, the Deputy National Chairman Northwest, Alhaji Inuwa Abdulkadir had confrontation with Kaduna State governor, Mallam Nasir El Rufai who allegedly ordered demolition of his property. El-Rufai is one of the closest governor to the President. Efforts to get Spokesman of the party, Mallam Bolaji Abdullahi, proved abortive as he did not reply messages sent to his phone as at press time.